Let’s face it. The impending takeover of technology is no longer impending – it’s here and nonprofit organizations must learn to adapt to stay relevant and sustainable in this new landscape. Along with a handful of other technological necessities, the ability to make donations online is non-negotiable. Fundraising 101 tells us to provide donors with multiple channels to give, so if you’re not online, you’re missing out! 1. Keep your donor on your website! People are wary of providing their credit card information over the internet – don’t add to that fear by sending them off-site. Choose a payment processor/donor database that is able to integrate into your website, securely, so that donors can feel confident making a gift to your organization online. 2. Your site is antiquated if it isn’t mobile friendly. According to Nonprofits Source, mobile giving donations increased by 205% in 2018. Do you want to miss out on growth like that? No way! Make sure your website is mobile-friendly. 3. A monthly/recurring giving option for your donor is an awesome opportunity for your nonprofit. So, why would you want to miss out? Nonprofits Source notes that “the average monthly online donation is $52 ($624 per year) compared to the average one-time gift of $128.” Recurring payments are especially attractive because they minimize “sticker shock” and break down larger sums into bite-sized, manageable monthly payments. It’s important to have this option available for your donors. 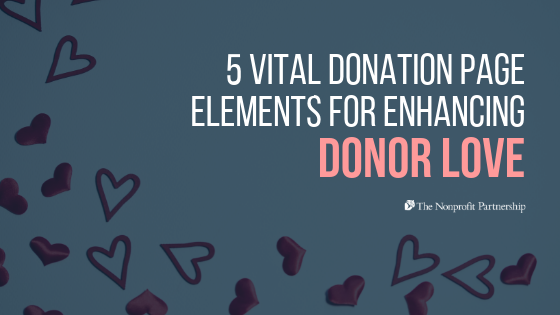 Recurring donors also have high retention rates and have been shown to be great planned giving candidates. 4. It’s an era of influencers – and not just in Hollywood! Yes, influencers are important for huge brands and in big cities, but they’re also important in your home town, too. Have you noticed an uptick in friends asking for recommendations for dentists or dog groomers on your personal Facebook feed? That’s the power of everyday influencers at work! While it’s great to leverage the power of Google, people still find value in getting real recommendations from real people. Your organization needs to recognize and embrace the social aspect of social networking. If you don’t have social sharing options on your donation page or embedded within your post-donation automatic email (hint, hint – this is next!) then you are missing out on the opportunity to spread the word about your nonprofit’s cause. Nonprofits Source notes that “84% of Facebook users share to show their support for a cause and highlight issues that are important to them” – again, a percentage you don’t want to miss out on! 5. A triggered email that donors actually want – the automated post-donation email. Let’s be honest, our email inboxes are overflowing with information, announcements, and deals. Sometimes, it’s too much and we’re tempted to hit the “unsubscribe” button until all of the emails stop rolling in! Well, this is not the case with the automated post-donation email. Donors expect a receipt and if you aren’t tailoring this receipt to enhance your organization’s message then you’re turning down an excellent opportunity. Instead of simply spitting out a confirmation number and the IRS-sanctioned acknowledgement copy, customize this email and add a story/image/video to keep the conversation going. Oh, and if you already forgot… don’t forget the social sharing options! In an era of unpredictable funding streams, you don’t want to test your organization’s donor love. Take these small steps to nurture your relationship with those who care about your cause. Looking for more donation page resources? Visit The Nonprofit Partnership’s Resource Library today!